Reigate: it’s looking like a beautiful (10) days! The HIGH pressure now building over the UK looks like persisting for at least a week and possibly for longer with a breakdown only hinted at from 15 July or later on current model runs. High pressure brings warm, dry weather with mostly clear skies as air sinks from aloft and warms and dries out as it does so. High pressure has pushed the jetstream (which guides LOW pressure storms at the surface) well north towards Iceland. So GREAT summer weather for Reigate and the UK over the next week and beyond! 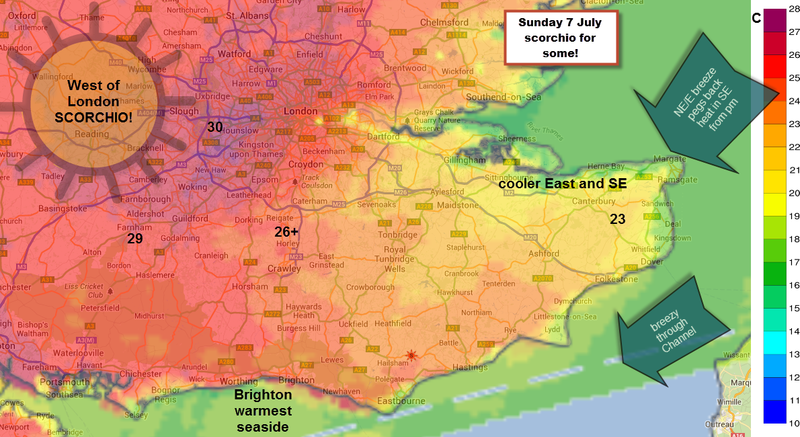 Temperatures will mostly be in the high 20’s and could climb to 30ºC locally. Night time temperatures are also going to remain well in double figures for most of this period. One potential spoiler for east and SE England could be the build up of brisk NE and E winds swinging round the edge of the HIGH as it continues to build in pressure during next week and slips north. The forecast Northerly / NE winds running south down the North Sea and swinging east into the Channel could reach 20mph and inland could be 10-15mph (supergeostrophic = surprisingly breezy in high pressure as winds swing out round the pressure gradient). The North Sea is still only around 13C sea surface temp and this will have a cooling effect on the breeze and east coast areas especially. This wind might even pick up some low cloud and mist for the east coast. How far inland this effect reaches remains uncertain but most likely the cooling will be restricted to the immediate coast. So, warm everywhere but west is certainly best! 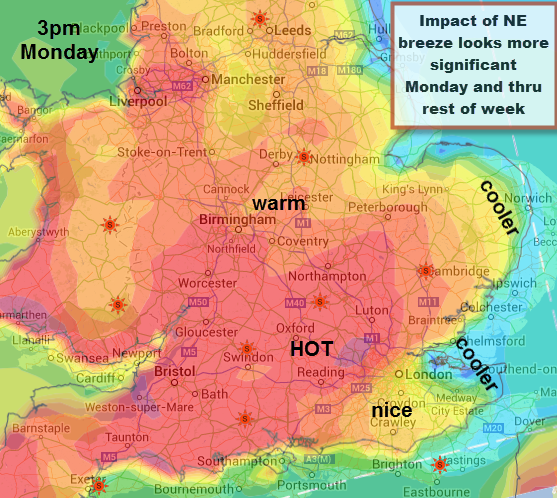 Update: scorchio for Sunday but thereafter in SE and Reigate it will be pleasant and “normally” summery and warm. The NE breeze will take edge of scorching temps in SE and especially near coasts. The NE may also bring cloud which will further peg back temps to a more normal feel at mid-20’s rather than high 20’s.